I realize that most people in the blog world have already completely skipped over Thanksgiving and are moving onto Christmas. But you know what? It's still a few days before Thanksgiving and I'm not ready to move on just yet. Well, it's a good thing that I'm not ready to move on. It makes me feel justified in pulling out a Fall wreath idea from last year and posting it in lieu of anything more exciting. 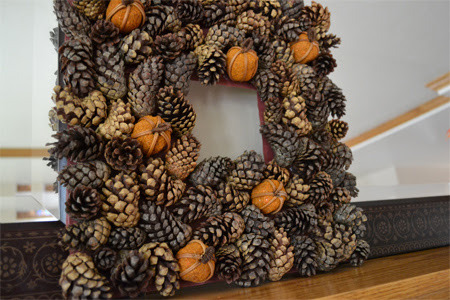 Last year, I needed some quick mantel decor, so I purchased a bag of pine cones and whatever those pumpkin things are, cut out a cardboard form and then hot glued the whole thing together. How's that for a lazy wreath? The best part is that I purchased the pinecones so close to Thanksgiving that they were 50% off. So the wreath cost me less than $5. Not bad for DIY decor that will be pulled out every year. On another note, I fear that my blogging will not be as consistent over the next little while. My ultra favorite pregnancy symptom has reared its ugly head: Restless Leg Syndrome. While my morning sickness seems to be diminishing, my restless legs are making my nights pretty difficult. I wake up in the mornings feeling like I've been running all night long. If only I were getting some health benefit... Here's to hoping that it will pass quickly and not last for the rest of the pregnancy.